Our comfortable lounge offers snacks, alcoholic beverages and other refreshments to help you relax and socialize after the game. 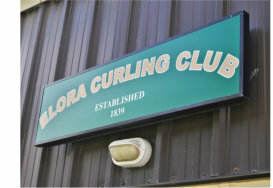 If you are coming to the Elora Curling Club to take part in one of our various Bonspiels or to join one of our Leagues, be sure to take in historic Elora with its unique shopping and restaurants. We also offer rentals for curling or non-curling events, and don’t forget to check out our Pro Shop too. Good Curling! For general inguiries please email - general_inquiries@eloracurling.com. Where we are located. Click or tap on the map for directions. Copyright © , Elora Curling Club , All rights reserved.